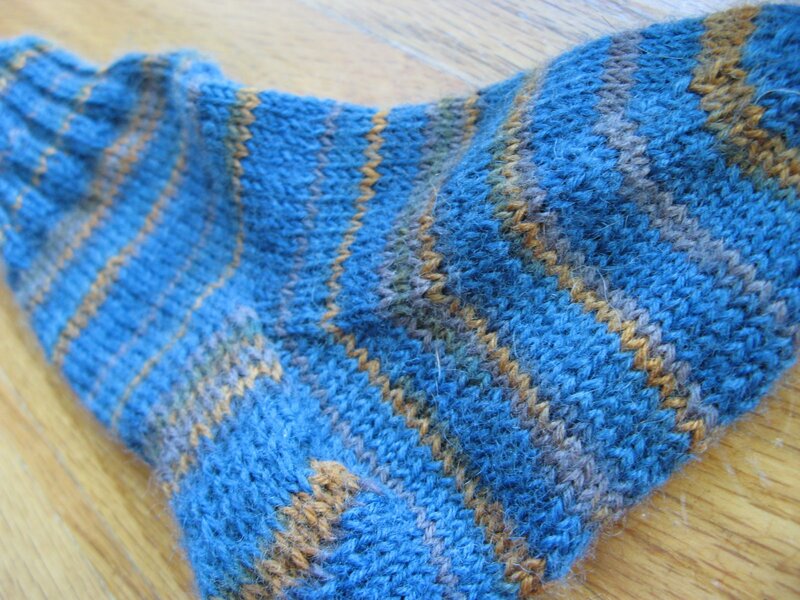 The first sock is done! Unfortunately it is too short 😦 I tried it on him and the heel kept slipping down. I measured, but I must have pulled too much. I may go ahead and just make two more or see if I can stretch it out a bit with blocking. It still turned out beautiful and looks great on him. I can’t wait to do the hat! For the next sock I’m going to change the cast on to 50 sts rather than 52 so that I have an even number of ribbing… I ended up just decreasing by two in the first sock and make sure I have enough length in the instep!! I’m most excited about a new project that I’m starting. It’s a birthday gift, so I’m resisting posting a picture or anything. The yarn is a fabulous blend of baby alpaca, silk and bamboo in a deep mulberry red. It’s a lace pattern too which has been challenging, but so far so good. If it’s smaller feet you need…I know where you can find a pair!